For more than half a century, China has used its pandas to help foster relationships with other countries. These diplomatic loans are now entering a new phase, according to researchers. The cuddly creatures attract a lot of attention. They're conservation icons and boost a zoo's brand. In fact, Edinburgh's loaned giant panda Tian Tian has even become a bit of a celebrity as the world watches with interest to see if she might give birth soon. Ever since the founder of China's communist party, Mao Zedong, used pandas as a way of entering into political discussions with other countries, the animal has been a national treasure. Just this week, China showed off 14 giant panda cubs that had been artificially bred at a research centre in Sichuan province. Edinburgh's panda deal was criticised at the time by environmental groups, which said it was more about commerce than conservation. Now a team from Oxford has quantified the new wave of panda diplomacy in a research article published in Environmental Practice. The team says panda diplomacy is only set to grow. The researchers looked at all the panda loans that had occurred in the last half-century and at the trade taking place since 2008. This was when the Sichuan earthquake devastated the main panda conservation centre, which meant many pandas needed re-homing. The team found that, after 2008, panda loans coincided with trade deals for valuable resources and technology. This new stage is based on "guanxi" loans, a Chinese term used to describe personalised networks of influence, trust, reciprocity and loyalty. Lead author Kathleen Buckingham at Oxford University, UK, says that sharing the care of such a precious animal strengthens the bonds that China has with its "inner circle" of countries. "In many ways China is testing the global technological capacity through panda loans. The USA has proved its capability and technological prowess to China with the birth of its panda cub. Can Edinburgh do the same?" Edinburgh Zoo received its pandas in 2011. 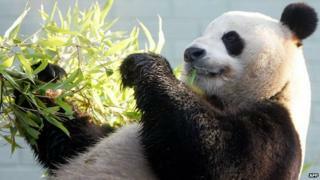 An agreed annual sum, paid to the Chinese government, is earmarked for giant panda conservation projects in the wild. But shortly after the panda exchange occurred, claim the researchers, trade deals were signed for salmon, renewable energy technology and Land Rover vehicles - contracts worth an estimated £2.6bn ($4bn). A Scottish government spokesman told BBC News: "Strengthening our relationship will bring substantial benefits to both countries. We are committed to working hard to deepen existing ties and establish new areas of cooperation - an approach that is clearly paying dividends." They add that Scottish exports to China have almost doubled in the past five years to £500m ($800m). At the same time that Scotland sealed its salmon agreement, Norway - which had, up to that point, provided most of China's salmon for two decades - lost its deal. The authors state this was was likely because Norway had awarded the Nobel Peace Prize to jailed Chinese dissident Liu Xiaobo. Relations between the two countries subsequently became strained. The researchers also say that panda loans in Canada, France and Australia coincided with trade deals for uranium, which China needs to enable it to increase its nuclear capacity by 2050. Japan also received two pandas from China in 2011, and both countries stated that they hoped the loan would improve relations soured by a sovereignty dispute over islands. The pandas are not simply exchanged in a straightforward quid pro quo for the supply of natural resources to China - the reality is much more subtle, says Dr Buckingham. "The panda can be used to seal the deal and signify a bid for a long and prosperous relationship. If a panda is given to the country, it does not signify the closing of a deal - they have entrusted an endangered, precious animal to the country; it signifies in some ways a new start to the relationship." She argues that China is interested in having "soft power influence through a global visual seal of approval" gained from loaning pandas. "Since 2008, China has needed to re-house pandas. Whether the housing issue is still pertinent or not, this wave has made it evident that China has a lot to gain through panda loans," Dr Buckingham told BBC News. Roderic Wye of the Asia programme at Chatham house, an independent think-tank focusing on international affairs, says China is now confident enough not to explicitly need panda loans to secure agreements on trade. "Of course there's an element of politicking associated with pandas but it's difficult to draw a direct correlation. The loans earn China soft-power brownie points at no real cost to themselves," he told BBC News. They pay £600,000 ($1m) to the Chinese authorities each year for the pandas and additional costs to fly in fresh bamboo to feed the pair. "The successful loan of the two giant pandas to Edinburgh Zoo is a symbol of the great friendship between our two nations. "Scotland's relationship with China is tremendously important." Dean Cheng from the Heritage Foundation, a conservative think-tank in Washington DC, comments: "It is not surprising that China would take advantage of this resource. If this leads to panda conservation that is a good thing. At the same time, the Chinese can assume the mantle of responsible environmentalism, which given other Chinese behaviour, is probably not a bad thing to lay claim to," he adds. The loan to Edinburgh was the first of its kind in 17 years. The day of the pandas' arrival on a specially chartered flight was even covered by rolling live news. This positive atmosphere creates the perfect setting for subsequent trade negotiations, says Henry Nicholls, author of The Way of the Panda: The Curious History of China's Political Animal. But he says that the conservation value of such loans is "dubious" as there is a "total lack of transparency" over where the money goes. "We know roughly where the money goes, but does the zoo have any say in how it is broken down and whether the money is working the hardest it possibly can? We have absolutely no idea about that." He adds that China's influence on other countries will "continue to strengthen" as it brings panda diplomacy to a whole new level. "China's expansion across the globe - and its use of pandas - has become more obvious and the motivation for the loans has become muddied. They are no longer just about conservation, but become increasingly bound up with political and economic ambitions." Can captive cubs help conservation? Who, What, Why: How do you fly a panda 5,000 miles?